Sonic Healthcare’s (ASX, SHL) interim results were positive with the pathology provider reporting it is on track to meet full year guidance. Revenues increased by a healthy 8%, while EBITDA gained 9% and net profit surged 16%, bolstered by a one-off net tax benefit in the United States. We retain a positive view on the long-term prospects for the company given scope for expansion offshore. Sonic Healthcare reported a statutory profit of approximately $229 million for the interim period ended 30 December 2017. That marked a 16.2% year-on-year increase, however less a one-time US net tax benefit of about $20 million, the increase was around 6.0%. Diluted earnings per share increased 14.9% to 54.1 cents. The dividend was given a 3.2% boost to 32 cents. Turning to the results in more detail and Sonic’s 1H18 revenue of $2.67 billion represented a solid 7.9% year-on-year increase at the statutory level. Revenue was supported by acquisitions in Germany and the US and hospital partnerships in the US. 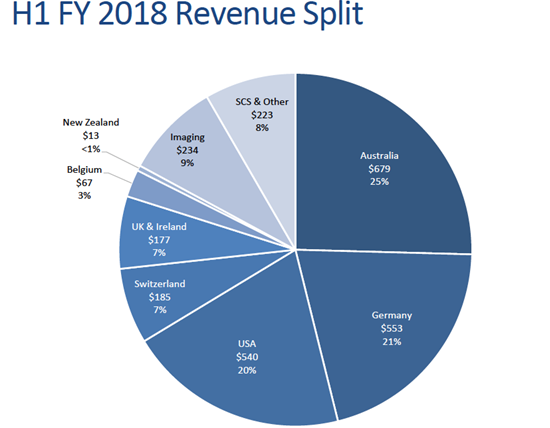 Sonic provides results on a constant currency basis as well given its increasing exposure outside of Australia. While exchange rate volatility can have a meaningful impact on Sonic Healthcare’s earnings in any given period, the underlying earnings run rate tends to be more predictable, albeit subject to periods of regulatory change. Examining the sales picture in more granularity, and the Laboratory division saw revenue growth of roughly 8%, including 3% organic (~4% normalised for working days) revenue growth. The Australian Laboratory business delivered strong organic revenue growth of 4.6%. Sonic has a strong brand and market position in Australia. US revenue was up 4.3%, with organic revenue growth of roughly 2% on a constant currency basis. Additional growth came from an acquisition in California completed in January 2017. The European Laboratory business led the way in terms of percentage growth, up 12.6% in constant currency terms. German growth was bolstered by the Staber laboratory and Bremen operations. In addition to clinical laboratories and diagnostic imaging, Sonic has other smaller businesses. The most significant of these are the Independent Practitioner Network (IPN) medical centre business and the Sonic HealthPlus occupational health business. Together, at the end of 2017 these involved 236 primary care clinics across Australia, providing facilities and administrative services to more than 2,200 General Practitioners. According to Sonic’s 2017 Annual Report, some 70% of all Australians live within 10 kilometres of an IPN/Sonic HealthPlus clinic. At the group level, earnings before interest, taxes, depreciation and amortisation (EBITDA) grew 9% to $445 million. The EBITDA margin improved 20 basis points year-on-year despite fewer working days in the 1H18 period. EBITDA included $6 million of non-recurring costs linked to acquisitions and restructuring, so underlying EBITDA was higher at $451 million. The company EBITDA growth was strongest in the imaging business, which received support from investments made in equipment and greenfield sites in recent years, along with ongoing efficiency initiatives. EBITDA growth in the laboratory business was boosted by acquisitions in Germany and the US and the margin showed “strong accretion” after normalising for working day differences. Gearing was effectively unchanged at the end of 2017 at 38.3%, compared to six months earlier when it was also 38.3%. Debt cover was 2.7 times, also unchanged and well below the 3.5 times bank covenant limit. Sonic shares are trading on circa 21 times estimated 2018 earnings, with a prospective of 3.3%. With the Australian business responding positively to management’s recent initiatives, a more stable operating environment and the offshore business still gaining momentum, we believe a premium rating is warranted. Disclosure: Interests associated with Fat Prophets own shares in Sonic Healthcare. Greg Smith is the Head of Research at Fat Prophets share market research and funds management house. To receive a recent Fat Prophets Report, call 0800 438 328 or CLICK HERE.